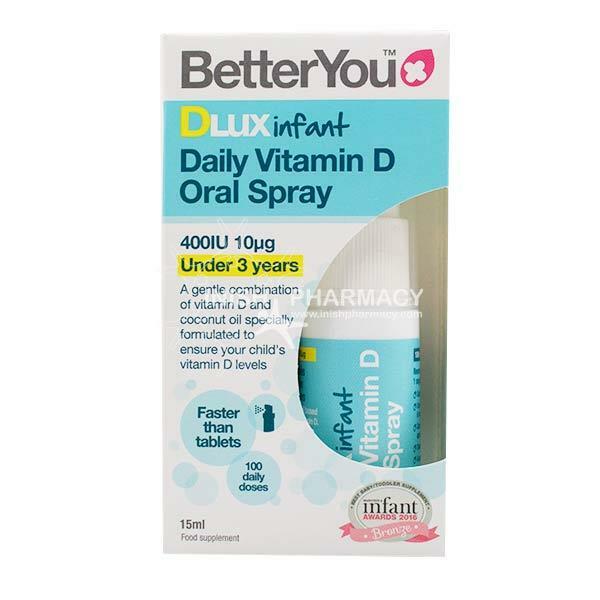 Better You Infant DLUX Daily Vitamin D Oral Spray 400IU is used to keep babies and children under 3 years, bones and teeth healthy and to maintain a healthy immune system and normal muscle function. The vitamin is in spray form and contains coconut extracts for better absorption into the bloodstream. Suitable for vegetarians, no artificial colours or flavours. No alcohol, gluten, salt, yeast or lactose. Shake well before use. Spray once into the mouth or the side of the cheek. Suitable for vegetarians, no artificial colours or flavours. No alcohol, gluten, salt, yeast or lactose.